To folk from other parts of Faerûn, the Shaar seems to be a vast expanse of nothingness that presents an unfortunate obstacle to trade among other lands. The fierce barbaric nomads and dangerous beasts that roam its grassy plains appear to spend all their time attacking caravans and fighting over precious water. Indeed, many feel that everyone would be better off if the Shaar just disappeared. But this immense sea of gently rolling hills is far more diversified and wondrous than most people understand. The Shaar is a land of hardship and fierce people, certainly, but it also, offers a bounty of unusual cultures, varied resources, and trade opportunities found nowhere else. The Shaar is an almost endless stretch of grassy plains that measures more than 1,500 miles from east to west and averages about 250 miles from north to south. Its western end touches the very tip of the Shining Sea, and its eastern end butts up against Veldorn, the Land of Monsters. It is bisected by two significant geographical features: a cliff face called the Landrise, and the Great Rift, a gouge in the earth more than 200 miles long and half that wide. Folk usually refer to the area west of the Landrise as the Shaar, arid the area east of it as The Eastern Shaar. 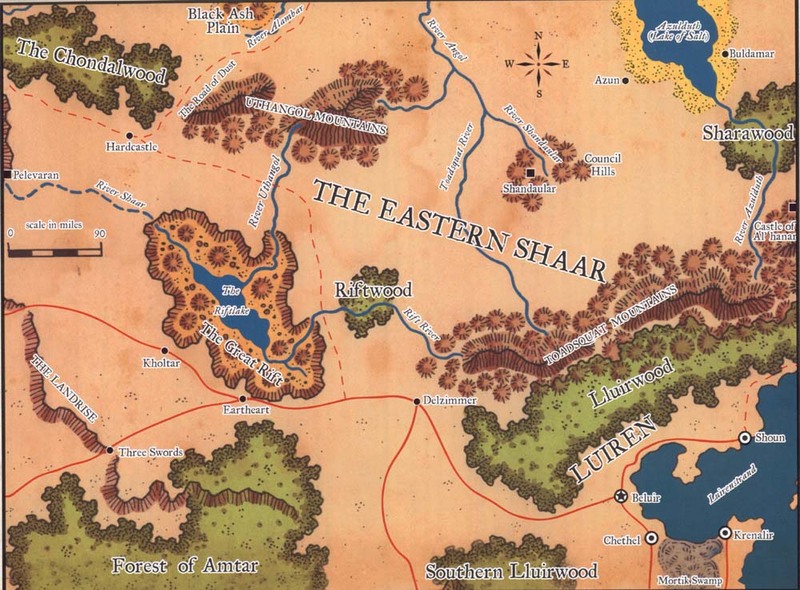 The Firesteap Mountains, a portion of the Chondalwood, the Uthangol Mountains, and the far southern border of Mulhorand all serve as borders along the north side of the Shaar. Similarly, the Channath Vale (a series of woods and mountains along the length of the River Channath), the Forest of Amtar, and the Toadsquat Mountains mark its southern boundary. A number of isolated woodlands and a couple of small collections of hills dot the otherwise featureless plain, and several shallow rivers and streams cross it, though these waterways tend to become sandy-bottomed gullies during the dry season. While not truly a desert, the Shaar does not receive much rainfall, and little other than coarse grass, cactus, and thorny bushes, grows on its surface. The days are blisteringly hot and the nights uncomfortably cold. Both geographically and meteorologically, the Shaar is a land of extremes. The sea of grass that makes up most of the Shaar is not as flat as outsiders claim, though compared to other parts of Faerûn, it might as well be. The forests, mountains, and rivers offer landmarks by which to navigate the open stretches, but the ground in between appears to be just an endless surface of flat earth to those who are not traversing it. The plains gently undulate, and the country's entire length slopes at an almost imperceptible angle from east to west. In fact, the whole of the Shaar drains into the Sea of Fallen Stars far to the north, and the Shining Sea to the west. The mountain ranges at the southern end of the Shaar form a continental divide, even though the Great Sea to the south is closer to much of the land. Throughout the Shaar's length, the grasslands are dotted with localized variations on the terrain. In some places, sand dunes interrupt the flat horizon, while in others, small valleys gather enough rainwater to form ponds, supporting a relative abundance of plant lite that attracts grazing animals and birds. Nomadic human tribes have roamed the Shaar since recorded history began, but little in the way of civilization exists here. From time to time, other powers have assumed authority over certain regions of these grasslands and even built settlements to manage trade, but only the crumbling remnants of their efforts remain. Humans are not the only nomadic creatures living on the plains. Wemics, centaurs, thri-kreen, and loxo also roam the Shaar, hunting the great herd animals for food and constantly squabbling over water rights. From time to time, gnolls, perytons, manticores, wyverns, and dragons challenge the nomads for supremacy of the area. In the southeast reaches of Mulhorand lies the Lake of Salt, a shallow, highly salinated body of water drained by the River of Swords. During the hot season, significant portions of Azulduth dry up to form salt flats for months at a time. By a quirk in the ancient treaty between Mulhorand and Unther, the Lake of Salt was claimed by neither empire. Even today, despite the fact that Mulhorand now rules much of Unther, the Old Empires display little formal interest in Azulduth. However, numerous powerful wizards and other Mulan have come south to investigate the Lake of Salt, particularly the ruins scattered about its shores. Evidence suggests that most of these ancient stones are the remains of a civilization built by a sauroid race more than thirty thousand years ago. Today, a couple of small communities sit on the shores of the lake (or on the edges of the salt flats, during the dry, season). The citizens of Azun and Buldamar make their livings mining the salt and fishing the lake. When caravans moving between the Golden Water and Council Hills pass their way, they barter whatever fish and salt they haven't consumed for other trade goods. From time to time, adventurers come to explore the ruins, causing the local economy to pick up slightly. The Channath Vale is a narrow stretch of land along the southern side of the Shaar, where the River Channath flows west into the River Talar. 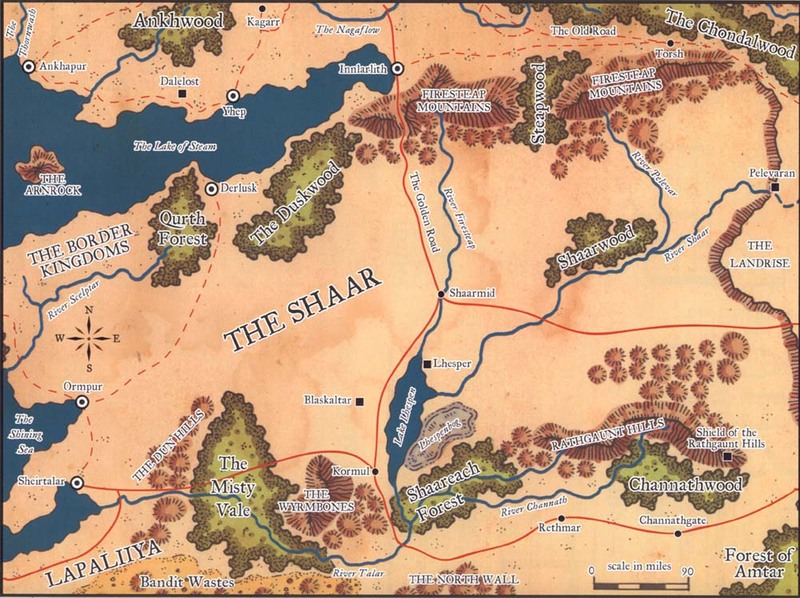 The North Wall of Halruaa and the Bandit Wastes form its southern boundary, while the Shaar flanks it on the north. The vale consists of three separate woodlands (the Channathwood, the Misty Vale, and the Shaareach Forest), as well as the Dun Hills and the tiny range of mountains known as the Wyrmbones. A major caravan route follows the south side of the vale, connecting the Great Rift with lands west of the Shaar. Several communities have arisen in Channath Vale along this trade way, and their citizens reap the benefits of caravan traffic. The Channathwood is a region of steamy jungle nestled against the southern slopes of the Rathgaunt Hills, where the headwaters of the River Channath cascade into and through the woods. This hot, stifling thicket is not terribly large, but its thick, overgrown interior is home to a tribe of ghostwise halflings. These reclusive hin keep to themselves most of the time, but they occasionally appear along the edges of the forest to trade with the human farmers who live on the outskirts of Channathgate. Such peaceful contact does not mean that friendly relations exist between the two peoples. Humans may gather herbs and berries on the edges of the forest without peril, but the halflings brook no deeper, invasion of their woodland home. The ghostwise tribe actively discourages such incursions through the use of deadfalls, snares, and even a few warning shots from slings or bows. This low stretch of hills shelters the Misty Vale from the coastal lands of Lapaliiya along the Shining Sea. The western slopes support scattered groves of olive trees, but little other vegetation grows there. Small herds of goats, some shepherded by local tribes, wander the region, feasting on scrub growth. The central hills hide many Lapaliiyan tombs, and wise travelers avoid the undead that continue to plague the area despite the efforts of Kelemvor's priesthood to clean it up. The mist-shrouded eastern slopes of the Dun Hills are covered with trees, making them nearly as impenetrable as the Misty Vale itself, though the wild elves who claim that forest do not venture so far west. The Misty Vale is a largely unexplored, thickly overgrown, stiflingly hot jungle tucked between the Dun Hills and the Wyrmbones. The River Channath flows through the center of the woodland, becoming sluggish where tangles of creepers and vines dangle down into its waters. The river teems with fish, and the occasional crocodile, snake, and more unusual jungle aquatic creature also call its waters home. In the canopy overhead, countless birds with colorful plumage cry out, their voices echoing through the deep green. In the courts of the High Suihk of Ormpur and the Overking of Lapaliiya, records dating back to the foundings of both realms speak of a race of feral elves native to the steaming jungle. According to these documents, the elves were so xenophobic that they made a practice of hunting down and killing any intruders in their ancient homeland. The descendants of the wild elves described in those ancient records still dwell in the same forest today. Their oral tradition relates how their ancestors betrayed the other wild elves to the depredations of the drow during the Grown Wars. Afterward, they were given this section of woodland to call home, though the drow sorcerers had released numerous dark horrors there. Remorseful over having betrayed their own kind, the wild elves of the Misty Vale withdrew into the forest so deeply that no one would ever see their guilt, vowing to live in isolation forever after. In accord with that philosophy, they embraced Fenmarel Mestarine, the Lone Wolf, as their patron deity. Today, their descendants still adhere to both their ancestors' isolationism and the worship of their deity. They tolerate no intrusion into their forest and slay all intruders without exception. Though the wild elves have hunted many of the deadlier monsters in this wood nearly to extinction, a few terrible creatures still lurk in the deepest shadows of the Misty Vale. This section of stifling, sultry woodland straddles the junction of the River Shaar and the River Channath at the point where the two waterways merge to become the River Talar. Like its companion forests along the Channath Vale, the Shaareach is overgrown with thick, lush vegetation, making overland travel slow and difficult. The converging waterways make it far easier to navigate the interior of the Shaareach by watercraft than overland, but either route is fraught with dangers - in particular, the packs of digesters that roam the woods and attack anything that looks edible. Because of the forest's proximity to Lake Lhespen and the Lhespenbog, a number of giant eels, water spiders, and even a few yuan-ti also prowl the waterways inside the Shaareach Forest. Near the center of the woods, where the tributaries converge to form the Talar, the banks are dotted with numerous ruins, all half choked and buried beneath the jungle growth. Few adventurers have managed to reach the ruins and explore them, but those who have found little evidence of their origin. This small chain of mountains wedged between two forests got its name from the tribesfolk of the Shaar, who thought the ridges and peaks resembled a skeletal dragon slumbering on the plain. Despite the colorful name, the only creatures inhabiting the mountains in any numbers are gnolls, led by a powerful chieftain known as the Wyrm Master (CE male gnoll ranger 8). The Wyrm Master conducts raids on caravans along the trade road between the. Wyrmbones and the Shaareach Forest, but Kormul has yet to muster the forces necessary to deal with the threat. Like a lonely island in a sea of grass, this cluster of hills sits smack in the middle of the Eastern Shaar. The hills would be utterly unremarkable except for the ruins of an ancient city in the central valley they enclose. Known as Shandaular during its heyday, the city rose up around the southern terminus of a two-way portal that connected with several other points throughout Faerûn. After the portal was shut down, the city slowly withered and faded away as its inhabitants took up the nomadic lifestyle and began to wander the Eastern Shaar. The final death knell for Shandaular occurred during a conflict with Unther and Mulhorand early in the third century DR.
Today, the site of the old city serves as a special gathering place for all the tribes of the Shaar. Every spring and fall, each tribe that is not engaged in war with its neighbors sends delegates to the ruins, where they hold peace talks and drink together, discussing alliances, hunting territory, and potential threats from other creatures. The area known as Council Hills is considered sacred neutral ground because many of the tribes have buried their ancestral chieftains in caves there. No fighting is permitted between nomads while either party stands among these hills. On numerous occasions, however, tribes have used violence to prevent enemy tribes from reaching the Council Hills gathering, setting up a perimeter of warriors to attack their approaching foes. The traditional home of Faerûn's gold dwarves, the wide canyon known as the Great Rift lies near the western end of the Eastern Shaar, not far from the Landrise. The bottom of this chasm lies more than 1,000 feet below the plains, surrounded by sheer cliff walls on every side. The arid, hilly ground that serves as the floor of the Great Rift is split down the middle by the Riftlake, a deep, icy-cold body of clear water that is often shrouded in morning mists. The lake is fed by the numerous small streams and rivers that flow throughout the Great Rift, as well as some very deep springs, which rumors suggest are fed by portals from the Elemental Plane of Water. The lake in turn drains into the River Shaar, which snakes along the valley floor before disappearing into a spray-filled gorge on the north end of the canyon. From there, it winds along a subterranean route more than 150 miles long before emerging in an impressive waterfall from a cave set into the side of the Landrise. Despite its high cliff walls, the Great Rift is wide enough that a person standing on the shore of the Riftlake can't actually see the walls on the other side. Thus, in many places, the valley floor seems more like open ground than the floor of a deep canyon. The weather inside the Great Rift is somewhat wetter than it is on the surrounding plains, though the ground is far from damp. The grasses that grow on the valley floor are a bit thicker and greener than the sparse, coarse weeds native to the rest of the Shaar, and plenty of animals - some herded by the dwarves for food - graze on this lush abundance. 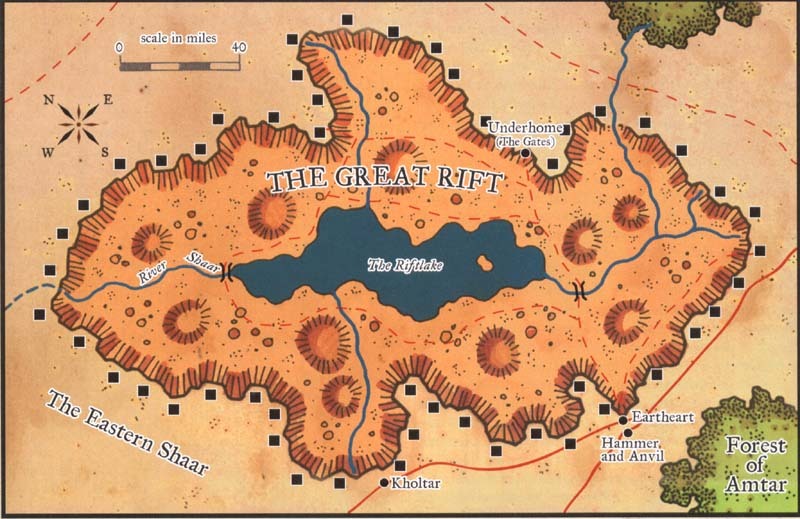 The Great Rift is but a fraction of the territory controlled by the gold dwarves, who also inhabit miles of underground caverns, tunnels, and fortifications connected to the surface in and around the canyon. Known as the Deep Realm, these hidden regions cover twice as much area as the canyon alone, mostly to the east and northeast. The Deep Realm is a place of wonder that features hanging spiral staircases, waterfalls and cascades operated by mechanical pumps, glowing, ever-shifting sculptures of magically radiant metal, and similar marvels. Beyond the reach and control of the gold dwarves lies a portion of the Underdark called the Deepwild. Known as Great Bhaerynden to the rest of the inhabitants of the subterranean realms, the Deepwild stretches outward beneath the Shaar in all directions, well beyond the boundaries of the Deep Realm. Included in this territory is the accursed drow city of Llurth Dreier, where Ghaunadaur reigns supreme. The Deepwild also encompasses a series of dragon lairs known as the Wyrmcaves and a huge underground waterfall called the Deepwall. Once the ancient home of the dwarves, the city of Bhaerynden once sat where the Great Rift is today, but deeper beneath the surface. Millennia ago, when the drow first descended into the Underdark, they invaded and conquered Bhaerynden and renamed it Telantiwar. Some time later, the great caverns that made up the heart of their new domain collapsed. Billions of tons of earth and stone came crashing down, crushing a dozen drow cities and forming the Great Rift on the surface. Though the settlements in the center of the region were destroyed, the leagues of tunnels around the periphery of the Great Rift remain intact and in use by various denizens of the Underdark. This escarpment divides the grassy plains into two halves and marks the boundary between the Shaar and the Eastern Shaar. Along the entire length of the Landrise, the eastern side is anywhere from 200 to 400 feet higher than the western side. The extended cliffs are broken in several places along the length of the Landrise, allowing travelers to move back and forth between the two elevations with relative ease. Most of these spots are nothing more than steep and often treacherous footpaths, but caravan routes cross the Landrise in several places where broader, more gently sloping breaches in the cliffs have been discovered. During rainstorms, the Landrise sports numerous cascading waterfalls, but most of the time, little water spills over the cliff edges. The Landrise is more than just a notable landmark. Frequently, tribes at war with one another attempt to position themselves on the high side of the cliffs so that they can watch for their enemies' approach and gain a tactical advantage in battle. Other tribes consider the Landrise a holy place and bury their dead in high caves on the faces of the cliffs, often in spots that appear completely unreachable. A few bodies have even been laid to rest on platforms braced by logs protruding from the cliff face. Visitors who have seen these hanging crypts have marveled at the distances the nomads had to carry the wood and the effort needed to get the bodies into position. The prevailing wisdom holds that magic was almost certainly employed to create these odd tombs. Though not as salty as Azulduth on the other end of the Shaar, Lake Lhespen is a mineral-laden body of water with salt-crusted shores that is unsuitable for most uses. Despite its inhospitable nature, several small villages and towns have sprouted up along its shores over the centuries, peopled by hardy souls who manage to eke out a living by gathering salt or harvesting the few fish that live in these waters. Nomads who do not wish to pay the higher prices for salt in Shaarmid to the north frequently come here to gather their own or trade for it. In addition, the occasional adventurer, wizard, or sage is attracted to the place by the various ruins scattered around the periphery of the lake - all remnants of older civilizations that occupied the Shaar in bygone days. In recent years, however, the yuan-ti and the creatures in the bog to the east have made the area around Lake Lhespen more dangerous than ever (see Lhesper, below). As a result, fewer and fewer caravans travel the road between Kormul and Shaarmid, preferring to utilize safer routes. The Lhespenbog is a region of soft, spongy grassland sprinkled intermittently with rivulets and ponds. The grasses of the plains grow incredibly tall here and mix with cattails, mangrove trees, and creeping vines and moss. Giant eels, darting water spiders, a few chuul, shocker lizards, and various oozes and shines dwell in the Lhespenbog, feeding on one another and on foolish explorers who wander too deeply into its depths. This marshy ground is also home to a number of undead. Sages believe that these creatures might once have been soldiers - part of a rebellion force that was cornered and slaughtered by troops loyal to the Shoon Imperium during the Seven Burnings campaign in the fifth century DR. Whatever the truth might be, the bog stirs with strange lights and sounds at night, and those who listen closely can hear the echoes of old battles being fought. Wedged between Lake Lhespen and the Lhespenbog on the west and the Landrise on the east, this stretch of rocky crags dominates the southern half of the plains of the Shaar. Worn down from eons of exposure to the relentless winds that scour the region, these mountains are home to colonies of perytons, wyverns, and manticores. These creatures fly out over the flat grasslands to hunt, making the whole region around the mountains a dangerous place for the unwary. The Rathgaunt Hills also support a large settlement of gnomes. In the heart of Sevenstones Hill, a prominent, tor whose rounded peak overlooks the caravan route to the north between Shaarmid and Kholtar, these gnomes have established a heavily fortified abbey known as the Shield of the Rathgaunt Hills. Manned by the Cult of Gaerdal, which numbers some 200 warriors and priests who venerate Gaerdal Ironhand, the abbey serves as a bastion of defense. The members of the cult tirelessly strive to keep the mountains safe for all gnomes in the area and to keep caravan traffic flowing. Led by Shield General Martak Ironwall (LG male gnome paladin 8/divine champion S of Gaerdal Ironhand), the gnomes have recently smoothed over some points of friction between themselves and the gold dwarves of the Great Rift. This new, more amicable relationship has led to a pact of mutual assistance and defense between the two regions. Just east of the Great Rift and generally north-northwest of Delzimmer lies the Riftwood, a small section of forest that appears lonely and isolated on the open plains of the Eastern Shaar. This woodland is generally round in shape and somewhat less overgrown with creepers, vines, and undergrowth than many of the near-tropical forests in the region. The Riftwood is not on the way to anywhere, nor is it particularly vital to anyone except the gold dwarves of the Great Rift. The inhabitants of the Deep Realm have dug a large passage up into the heart of the Riftwood and established a small logging community there, shielded from the prying eyes of visitors. The gold dwarves harvest timber from the Riftwood and take it to their homeland below the Shaar for use in various kinds of construction, including scaffolding for new digs, furniture for which stone is unsuitable, and so forth. They are careful to take no more wood than they need from the forest, and to replant sections they have already cleared so as not to exhaust their supply of wood. The gold dwarves maintain a large enough force on or near the surface to keep most natural predators away from the logging operations, but they allow those same beasts (panthers, snakes, giant beetles, and so forth) to remain on the periphery in hopes that they can keep unwanted visitors from entering the forest. The River Shaar actually originates inside the Great Rift, where it drains the icy-cold Riftlake. The river plunges into a deep chasm at the north end of the canyon, where it begins an underground journey of more than 150 miles through caverns, fissures, and a couple of subterranean lakes. The gold dwarves channel some of the river's water into their realm for drinking, sluicing in their mines, and as a means of transport to different parts of the Deep Realm. The River Shaar returns to the surface at the Landrise, emerging from a broad cavern at the base of the cliffs almost due east of the Shaarwood, near the ruins of Peleveran (see below). Still icy cold from its journey through the earth, its water is crystal clear and uncontaminated by the dwarven mining operations below the surface. From the Landrise, the River Shaar winds its way across the Shaar, cutting a wide but gentle and relatively shallow course with numerous fords along its length. Eventually, it widens out into the body of water known as Lake Lhespen, then flows into the Shaareach Forest, where it merges with the River Channath to become the River Talar. Many tribes rely on this waterway for sustenance, knowing that it is one of the few rivers in the Shaar that does not dwindle much in the hottest part of the year. Whereas many other watercourses are reduced to tiny trickles in sun-baked mud flats during the summer, the River Shaar flows strongly all year round. Some fish swim in its waters - primarily channel varieties and bottom feeders that prefer the sluggish motion of its current. The Shaarwood lies just north of the River Shaar, about equidistant between Shaarmid and the Landrise. Unlike most of the forested regions of the Shaar, the Shaarwood is a dry, dusty woodland, and its trees have been twisted and stunted by the eternal winds that blow across the grasslands. The Shaarwood is composed mostly of cedar and oak, interspersed with plenty of cactus, razor-sharp grasses that grow chest-high to a human, and thorny shrubs that slash and scrape any creature that tries to pass through them. The ground is hard-packed and arid, suitable only for lizards, snakes, scorpions, and ground squirrels. The nomads of the Shaar occasionally come to the Shaarwood to harvest some of the peppers that grow. in abundance there, which they use to season their food. Some also attempt to gather berries from the thorny bushes, though doing so is hot, tiring, bloody-fingered work. The forest is completely unsuitable for the nomads' mounts because the grasses are unpalatable to the horses, and the underbrush can quickly turn a rider's legs into raw meat without proper protection. Even the horses are susceptible to scratches and cuts from the razor grasses that grow here. Bandits occasionally hide out in the Shaarwood for brief periods, some, to avoid capture and others to rest between raids on the caravan route just to the south of the woodland. Sometimes referred to as the Drakewood, the Sharawood sits between Azulduth to the northwest and the Toadsquat Mountains to the south. Thick and overgrown with tropical vines and flowering creepers, the Sharawood holds many secrets, since few sentient beings have ventured into its murky interior. The nomads of the plains occasionally come to the edge of this forest to gather herbs, hunt for food, or hide from their enemies, but they rarely venture deeper into the woods because of the many sword spiders that dwell there. These dangerous predators hunt any creature that enters the forest, and occasionally they come out as far as the edge of the woods to prey on herd animals that stray too close to the trees. As if the spiders didn't present enough danger, a traditional story says that a terrible undead creature that steals people's bodies and turns them into zombie slaves haunts the Sharawood. In fact, this tale is not far removed from the truth. An extremely old and powerful dracolich known only as the Everlasting Wyrm inhabits the darkest, deepest part of the Sharawood, ruminating on its nefarious plots and slowly collecting a brood of minions. Though it keeps to itself and tries to remain unnoticed by the nomads of the plains, it does not hesitate to enslave any tribesfolk who discover its existence. The dracolich's worst enemies are the Knights of the Eternal Dragon, a group of undead stalwarts hidden away in the ruins of the Castle of Al'hanar, just south of the Sharawood. Once every century, the knights arise and charge into the woods to do battle with the dracolich and its horde of living spawn. Though the knights always destroy the dracolich and all its minions, this battle seems doomed to play out over and over until the end of time because true to its name, the Everlasting Wyrm simply reforms over a decade or two and begins its machinations again. This chain of peaks stretches eastward from the tip of the Chondalwood, forming an effective barrier between the Shaar on the south side and the Black Ash Plain and the Green Lands of Unther to the north. Windswept and relatively barren of vegetation, the Uthangols serve as the northern boundary of the territory claimed by the gold dwarves of the Great Rift who have followed and expanded on the endless tunnels and caverns that stretch from their canyon all the way beneath the heart of the mountains. Over the years, the gold dwarves have tunneled up into the mountains from below, riddling the Uthangols with mines. On the surface, black-skinned stone giants that migrated here from the Black Ash Plain dwell on the mountainsides. They fight for habitable spots on the lower slopes with gnolls and phase spiders, and avoid the hippogriffs, wyverns, and copper dragons that dwell in the higher reaches.